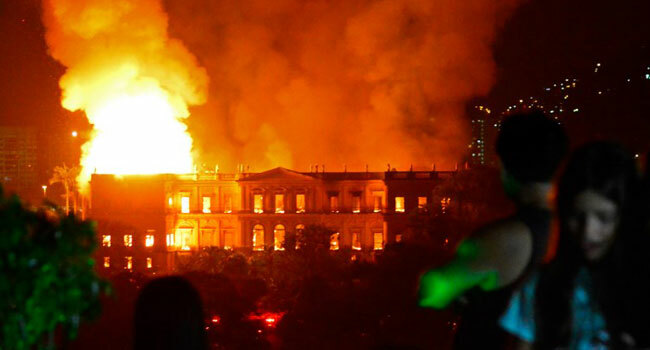 People watch as a massive fire engulfs the National Museum in Rio de Janeiro, one of Brazil’s oldest, on September 2, 2018. The cause of the fire was not yet known, according to local media. Five hours later they had managed to smother much of the inferno that had torn through hundreds of rooms but were still working to extinguish it completely, according to an AFP photographer at the scene. 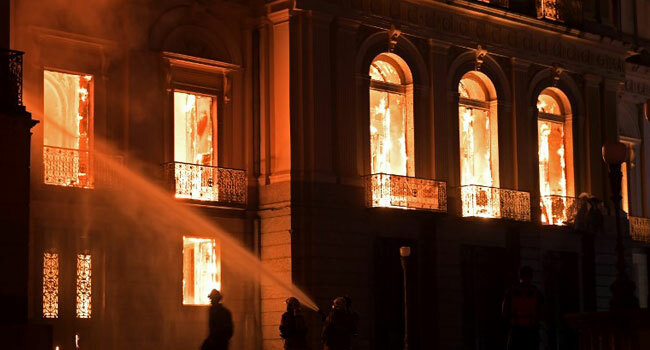 Firefighters work as a massive fire engulfs the National Museum in Rio de Janeiro, one of Brazil’s oldest, on September 2, 2018. The cause of the fire was not yet known, according to local media. The fire “spread very quickly; there is a lot of inflammable material,” a spokesperson for Rio’s fire department told AFP, adding that there were no reports of victims so far. “The loss of the collection of the National Museum is incalculable,” he said. The museum also housed the skeleton of a dinosaur found in the Minas Gerais region along with the largest meteorite discovered in Brazil, which was named “Bendego” and weighed 5.3 tons. Pieces covering a period of nearly four centuries — from the arrival of the Portuguese to the territory in the 1500s until the declaration of the first Brazilian republic in 1889 — had also been stored there. He said the museum, a former palace that was once the official residence of the Portuguese royal family, had never had the necessary support. The fire comes as campaigning for October’s critical presidential vote gets underway, one of the most uncertain Brazilian elections in decades. Senator Lindbergh Faris of the country’s leftist Workers’ Party hit out at the institution’s lack of funding and blamed it on spending cuts ordered by the government. Sa Leitao also said the fire struck just after the South American country’s National Development Bank had signed a sponsorship contract aimed at revitalization.